After way too many leaks, Sony has properly announced the QX pair of cameras. 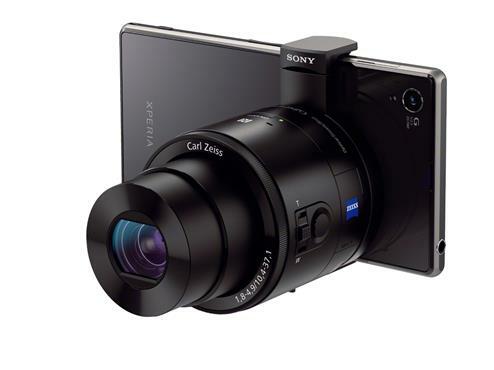 The smaller QX10 (pictured after the break in white and gold) comes with a 25-250mm equivalent lens at f/3.3-5.9 and an 18 megapixel 1/2.3″ sensor. Right. Now, the real exciting one is the QX100, as seen above. It is bigger, but it comes with what is essentially the innards of the RX100: That 20 megapixel 1″ sensor and 28-100mm equivalent f/1.8-4.9 lens. What I liked about the RX100 was its operation speed: It had fast autofocus and very low shutter lag, so I hope it carries over through here as well. For me, this could be a big thing. Smartphone cameras just aren’t good enough for me, and even with the GH3 I am using now, it is just too much hassle. RAWs cannot be transferred, the camera is not clever enough to generate a JPEG to do that, slow app, slow connection. I once took a nice photo just before arriving at the subway station, and by the time I actually got on the train, I just about got the image transferred to my phone. To camera manufacturers: This is not acceptable workflow, be it in ease of use or speed. Now, the other bad news is that there is going to be limited manual control, and no RAW mode. As an aperture priority shooter, I can live with the former, but the latter irks me a bit. While for the purpose of being a smartphone companion mean RAW won’t be needed there, I am sure many of us enthusiasts would love to have an option for those really nice shots to be properly post-processed in our favourite software. The QX10 and QX100 will be shipping in late September for US$250 and US$500 respectively. A bit pricey, but maybe a good discount will make it worthwhile. CK: I am kind of skeptical about this. If I want to carry to gadgets, I’d get a compact camera and use it in tandem with my smartphone. The older Sony RX100 is a little more than the QX100 and has all the features you need for an advanced compact camera. What would be nice would be for Apple’s camera connection kit or the Lightning to SD Card Reader to work with the iPhone, and someone to come up with an Android equivalent. Sure, it’s a little clunkier than the QX100/QX200 but I think that’d be a better deal. Plus you get to use your existing camera too. And of course, there’s also the EyeFi and other similar devices which lets you transfer files to your smartphone too.